In an age of computer-generated everything, the surreal scenes look animated. But this magic is real. “That’s why we do the air-to-air filming, so we don’t have to use computer-generated images,” said Elliott Pesut, integrated marketing manager for Alaska Airlines. Alaska’s “Adventure of Disneyland Resort” flies through Monument Valley. In another video sequence, Alaska’s “Adventure of Disneyland Resort,” lovingly referred to as the “Cars”-themed airplane, cruises past the pillars and buttes of Monument Valley near the Arizona-Utah state line, returning characters Lightning McQueen and Mater to the landscape that inspired their fictional hometown. The red rocks serve as a perfect backdrop for the cloud-colored aircraft. “This is like three-dimensional chess,” said Brad Burger, manager of video communications at Alaska. “You have the camera plane, the ‘target’ plane and the background, and these objects are being balanced in real time moving at 220 knots, so that’s really different from anything else you’d do in film. 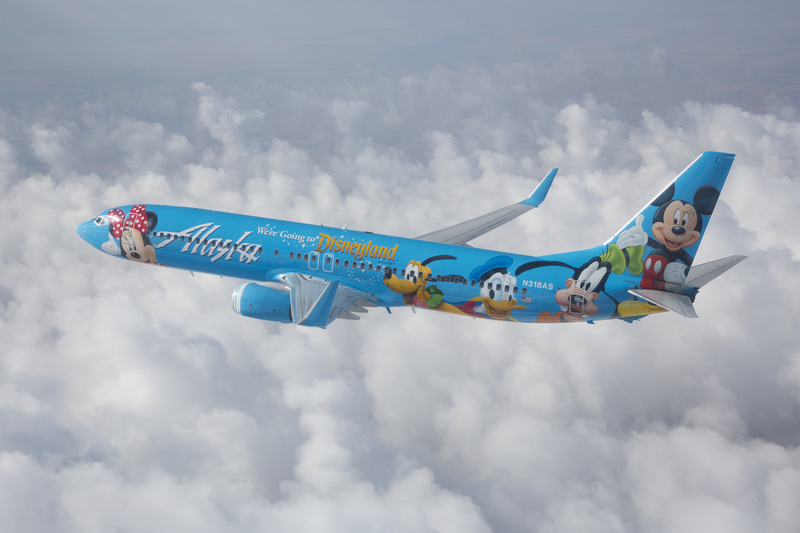 Alaska hired Clay Lacy Aviation to film two of the airline’s four Disney-themed planes. 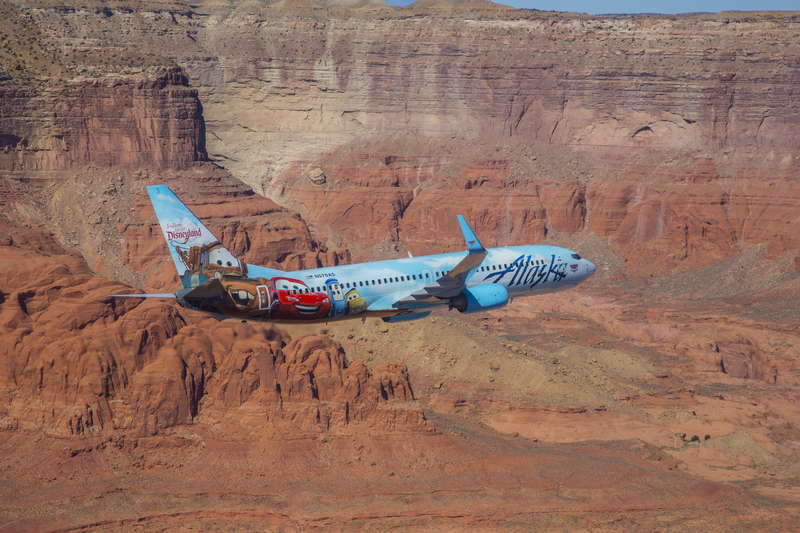 The shots will be used by Alaska and the Disneyland Resort to promote their partnership and Alaska’s kid-friendly amenities – and serve as a reminder that Alaska has the most nonstop flights between the Pacific Northwest and Southern California. “We’ll shoot five hours and probably use five seconds for the next five years,” Pesut said. Months of planning preceded the two days of filming. Attention to detail is key. The “target” plane would fly north to south to get the best morning light on the left side of the plane, so the word “Alaska” would be most readable from nose to tail. All the window shades were up and no customers were onboard. Pilots were instructed to “look like pilots” – hands on the yoke, perfect uniforms. “We’ll be able to count the freckles on your nose,” said photographer Chad Slattery. A map from FlightAware shows the flight path of the Alaska Airlines Spirit of Disneyland II during the air-to-air video shoot. 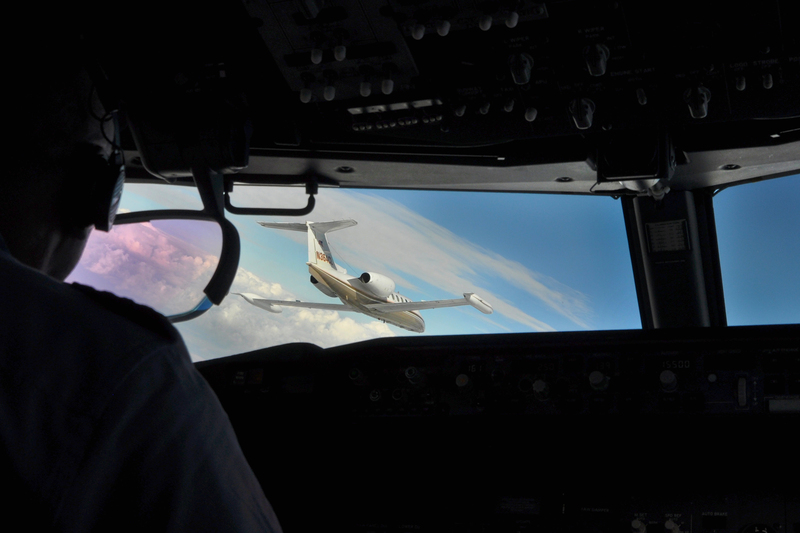 Lacy’s pioneering Astrovision camera system uses patented periscopes on the top and bottom of the Learjet, which allow for a full circle of rotation during filming. Nearly 40 years of aerial coordination and filming experience translates to safe, efficient filming sessions, Lacy says. On the first morning of filming, the “Spirit of Disneyland II” departed Seattle-Tacoma International Airport to scout for perfect white clouds to serve as a backdrop for the dark plane. 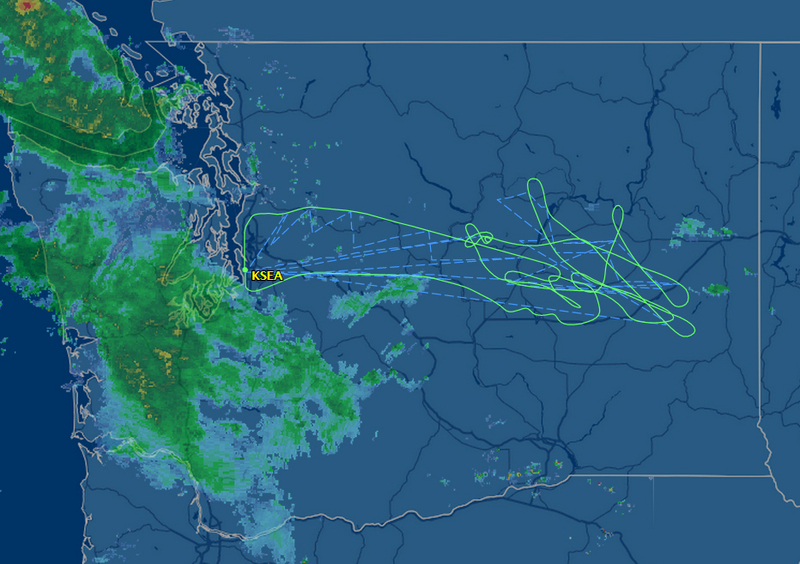 This “target plane” was piloted by Alaska Airlines Capt. Scott Sander and Capt. Bruce Patterson, who served as first officer on the flight. The pair coordinated with air traffic controllers as they sought the best stretches of sky over Eastern Washington. Meanwhile, the Learjet departed Boeing Field packed with camera gear, a cinematographer, an Astrovision tech, a photographer, Clay Lacy and another pilot. A member of the Alaska Airlines video communications department rode along in the Learjet to oversee the project. For the next few hours of filming, the Learjet hovered above, below, beside and behind the 737. 5 comments on "How’d they film that? Alaska Airlines’ Disney airplanes star in new air-to-air video"
How can i get a job filming video like this??? Makes me want to go to Disneyland! Went to Disney World when I was about 13 just after that park opened up. I think a Star Wars themed Disney plane should be in the future. (no pun intended) It could very well be our most popular paint scheme ever! James, Star Wars is in the past! Why should we have their plane now?